November 1 is the 305th day of the year(306th in leap years) in the Gregorian calendar.There are 60 days remaining until the end of the year. 1790 – Edmund Burke publishes Reflections on the Revolution in France , in which he predicts that the French Revolution will end in a disaster. 1928 – The Law on the Adoption and Implementation of the Turkish Alphabet , replaces the Arabic alphabet with the Latin alphabet. 1945 – The official North Korean newspaper, Rodong Sinmun , is first published under the name Chongro. Year 365 (CCCLXV) was a common year starting on Saturday of the Julian calendar. At the time, it was known in the West as the Year of the Consulship of Augustus and Valens. The denomination 365 for this year has been used since the early medieval period, when the Anno Domini calendar era became the prevalent method in Europe for naming years. The Alemanni were a confederation of Germanic tribes on the Upper Rhine River. First mentioned by Cassius Dio in the context of the campaign of Caracalla of 213, the Alemanni captured the Agri Decumates in 260, and later expanded into present-day Alsace, and northern Switzerland, leading to the establishment of the Old High German language in those regions, by the eighth century named Alamannia. The Rhine is a European river that begins in the Swiss canton of Graubünden in the southeastern Swiss Alps, forms part of the Swiss-Liechtenstein, Swiss-Austrian, Swiss-German and then the Franco-German border, then flows through the German Rhineland and the Netherlands and eventually empties into the North Sea. Beornstan was an English Bishop of Winchester. He was consecrated in May 931. He died on 1 November 934. After his death, he was revered as a saint. Year 970 (CMLXX) was a common year starting on Saturday of the Julian calendar. 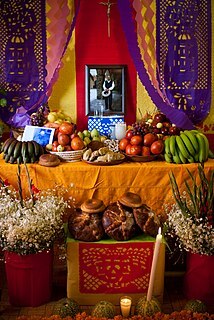 The Day of the Dead is a Mexican holiday celebrated throughout Mexico, in particular the Central and South regions, and by people of Mexican heritage elsewhere. The multi-day holiday focuses on gatherings of family and friends to pray for and remember friends and family members who have died, and help support their spiritual journey. In 2008, the tradition was inscribed in the Representative List of the Intangible Cultural Heritage of Humanity by UNESCO. Haiti, officially the Republic of Haiti and formerly called Hayti, is a country located on the island of Hispaniola, east of Cuba in the Greater Antilles archipelago of the Caribbean Sea. It occupies the western three-eighths of the island, which it shares with the Dominican Republic. 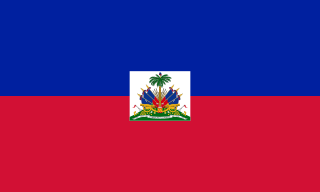 Haiti is 27,750 square kilometres (10,714 sq mi) in size and has an estimated 10.8 million people, making it the most populous country in the Caribbean Community (CARICOM) and the second-most populous country in the Caribbean as a whole. All Saints' Day, also known as All Hallows' Day, Hallowmas, the Feast of All Saints, or Solemnity of All Saints, is a Christian festival celebrated in honour of all the saints, known and unknown. In Western Christianity, it is celebrated on 1 November by the Roman Catholic Church, the Anglican Communion, the Methodist Church, the Lutheran Church, the Reformed Church, and other Protestant churches. The Eastern Orthodox Church and associated Eastern Catholic Churches and Byzantine Lutheran Churches celebrate it on the first Sunday after Pentecost. Oriental Orthodox churches of Chaldea and associated Eastern Catholic churches celebrate All Saints' Day on the first Friday after Easter. In the Catholic Church, holy days of obligation are days on which the faithful are expected to attend Mass, and engage in rest from work and recreation, according to the Third Commandment. December 31 is the 365th day of the year in the Gregorian calendar. It is known by a collection of names including: Saint Sylvester's Day, New Year's Eve or Old Years Day/Night, as the following day is New Year's Day. It is the last day of the year. The following day is January 1 of the following year. December 16 is the 350th day of the year in the Gregorian calendar. There are 15 days remaining until the end of the year. ↑ "The Life and Times of Caroline Still Anderson · William Still: An African-American Abolitionist". stillfamily.library.temple.edu. Retrieved 2019-02-19. ↑ Michael Jones, Ducal Brittany, 1364–1399: relations with England and France during the reign of Duke John IV, Oxford University Press, 1970, pp. 106, 123–4, 128, 130, 200. Wikimedia Commons has media related to November 1 .